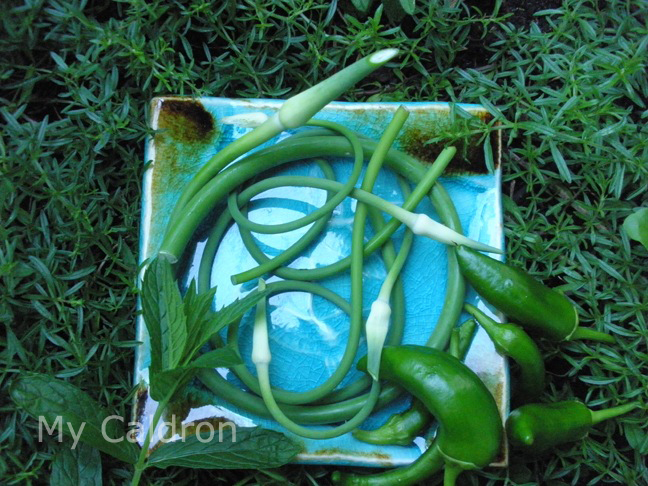 Green garlic and garlic scapes add delicate, refreshing flavor to salads, and any type of dish you would normally use garlic for. I use them particularly in herbs-mixed polo with fish. They are easy, fun, and extremely rewarding to grow – even in pots. Simply break the bulbs and plant them 5 cm deep in a sunny spot. They should be at least 10 cm apart in a rich, weed-free soil. In Montreal, the planting time is mid September.